It should come as no surprise that I have a little sweet tooth problem. Two of my biggest loves are chocolate and peanut butter. One of the best things in the world is taking a spoon (or an index finger, whatever) of a really good nut butter and then covering that spoon with chocolate chips. I could eat mounds of that. Because I can eat mounds of that, a long time ago I started spreading out that same amount of peanut butter and chocolate (that one bite) onto something healthy. I found that distributing that little indulgence over a fresh, crisp apple made it seem like the good stuff was multiplied and it filled me up and satisfied my sweet tooth. Since then, this has become one of my favorite sweet snacks, and something fun I make with my kids, too. I eat chocolate every day. True story. 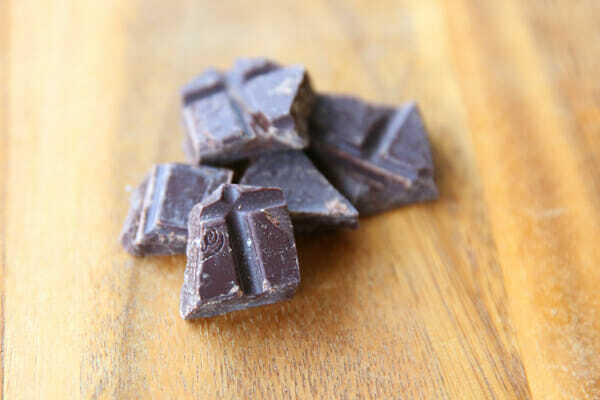 Dark chocolate has health benefits (WebMd told me so) like antioxidants and properties that lower blood pressure. 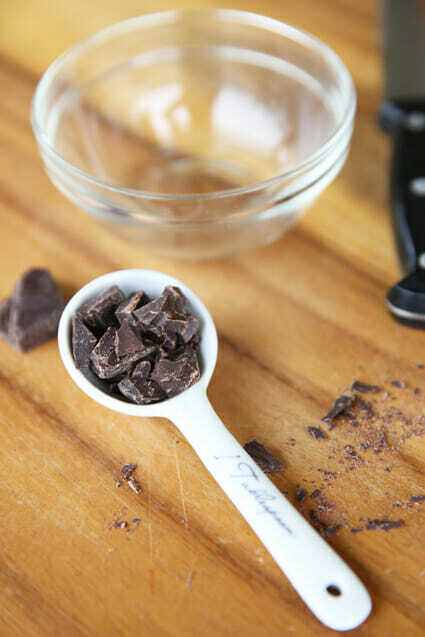 Chop up a tablespoon of dark chocolate or dark chocolate chips. Place them in a little bowl with 1/4 teaspoon coconut oil (or canola oil). As you melt them together, the oil helps make the chocolate drizzly. And what goes better with chocolate than peanut butter? 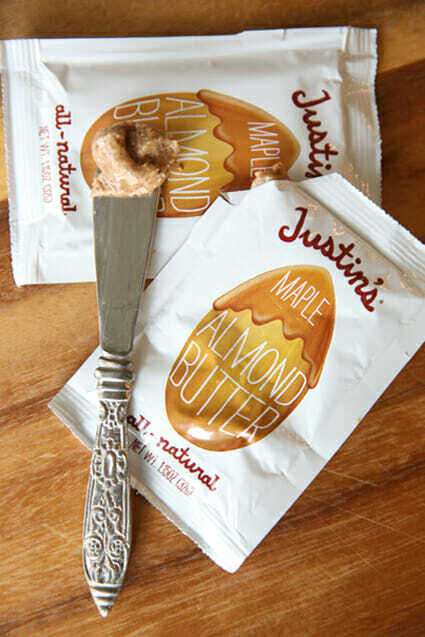 I’m obsessed with this maple almond butter from Justin’s. Use whatever you’ve got in your pantry. I heat up the peanut butter in the microwave for just a few seconds so it’s stir-able and drizzly as well. For the topping I like a little crunch. I always keep a container of unsweetened large flake coconut in my fridge. I buy it in the bulk bins of my local grocery store. When toasted, it’s very nutty. Regular sweet coconut flakes would obviously be fine here, too. 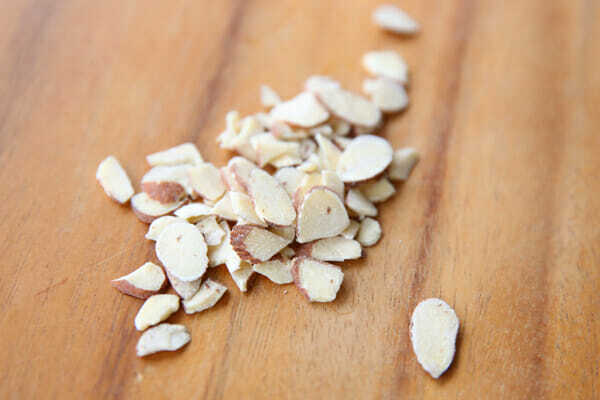 And lastly a few toasted almonds. Healthy oils and a tiny bit of protein (since we’re only using a little sprinkle). Because all of that goodness is spread out, you get filled up while still enjoying the little indulgence. And everyone should have a little indulgence. Also a little chocolate. And peanut butter. Every day. Core apple and slice into 1/4 inch slices. Arrange on a plate. Place chocolate and oil in a small bowl and microwave until melted and smooth. Melt peanut butter until soft and stirable (able to drizzle with a spoon). 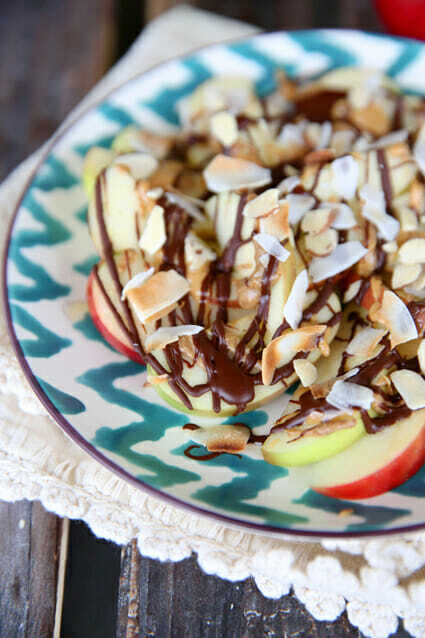 Drizzle chocolate and peanut butter over apples. Sprinkle coconut and almonds on top. Eat up. You obviously don’t have to measure here- just add things to your liking. I’m providing measurements that coincide with nutritional information. Other toppings we love are: caramel sauce, melted nutella, crushed peanuts or cashews, and cinnamon. You are a genius! This will be a great snack for my kids (and me, who am I trying to kid?) when they come home from school today. We just had these. While I was drizzling, my 2-year-old watched, chanting “yummy in my tummy-tum-tum” and they were. My 5-year-old just asked if we can have them more often. Everyone loved them! Oh yum!!! Thanks for the delicious snack idea! 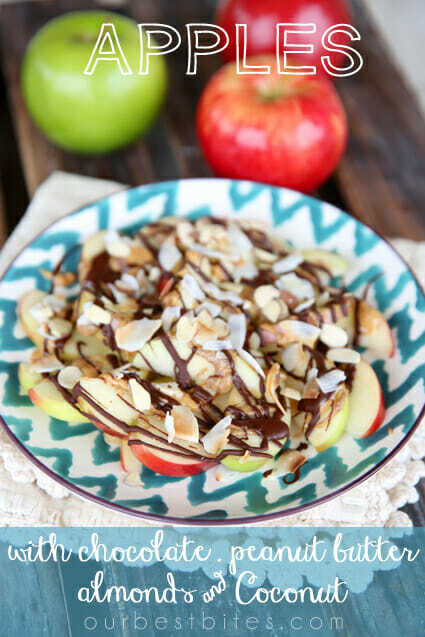 I’m hooked right now on apples with TJ’s cookie butter chocolate swirl – never occurred to me to slice and drizzle like this, though! We love these…and call them apple nachos 🙂 I like them because the peanut butter sticks so nicely to the apples, unlike dipping apples in peanut butter. The pb always seems to slide off when I dip! I’ll have to see if I can get my hands on some of the unsweetened coconut! While reading the post the first thing that came to my mind was this would make a great breakfast. 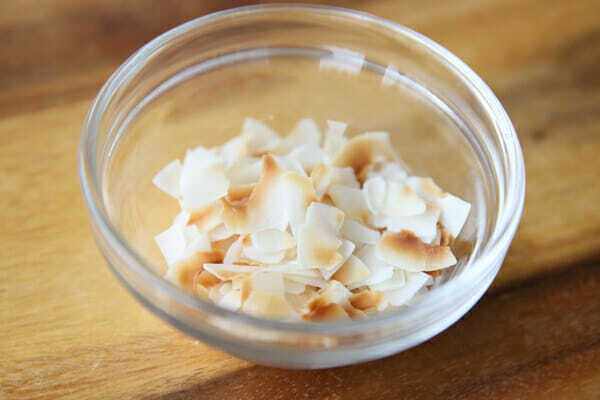 This might be a dumb question but does this type of coconut have a different texture than the shredded? I don’t mind the flavor but both my husband and I do not enjoy the texture of the shredded variety. Thanks! No Robin, it’s quite different. More like a thinly sliced and toasted nut! I’m all over this! Love simple & tasty! I’ve been loving your healthy recipes lately! Thank you! I make these but call them apple nachos also. It has been a while, so thanks so much for the reminder. I will have to try that maple almond butter. I also love TJ’s coconut chips. Little granddaughter and I made these tonight. 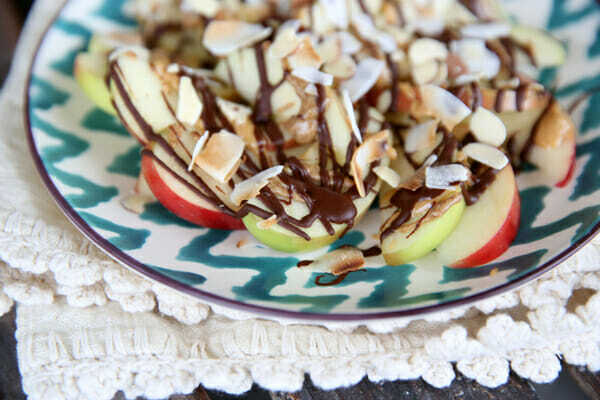 Her little eyes popped open at the yummy goodness of these apples dripping with chocolate, peanut butter, coconut chips and almonds. Not her usual boring snack of apples with a spoonful of peanut butter. Love my coconut chips on oatmeal with berries and almonds. I never thought to use them with apples-Thanks! So happy you and the little one enjoyed them! I love this! 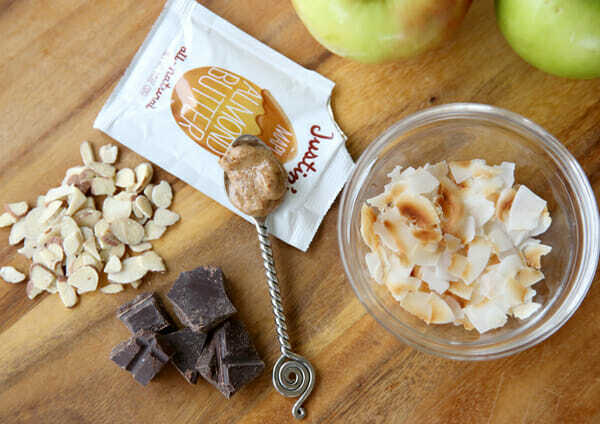 I’ve been eating apples and peanut butter forever but never thought to add the rest of these goodies. Yum!! What a great way to indulge your sweet tooth without overdoing it. Oh and I LOVE that you’ve been providing the nutritional info for your recipes. It helps me out so much! How do you get nutella to melt well? It’s always so clumpy with me and the bottle even says not to microwave. . . . Delicious! I absolutely love these. My daughter and I have made them twice this week. Such a fun and easy snack to whip up! That’s an awesome idea! My nephew will definitely love this. I just have one problem, he doesn’t like almonds or any kind of nuts, what would be the best alternative for this? Good thing I have dark chocolate bars at home. You could just leave those off, or perhaps a sprinkle of granola for crunch?